Our range of products include hydraulic press, two high roll mill and water hammer forming equipment. 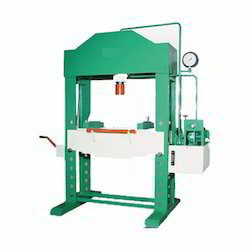 The concept of the hydraulic press is based on Pascal's theory, which states that when pressure is applied on fluids in an enclosed system, the pressure throughout the system always remains constant. In simple words, a hydraulic press is a machine that makes use of the pressure exerted on the fluids to crush something. Rolling is a process of metal forming, in which the reduction takes place when the metal is passed through two rolls rotating in opposite direction. The metal can be rolled either in hot or cold condition. Rounds, squares, flats, angles, channels and thick plates are some of the materials obtained by hot rolling, in which the metal is heated to a temperature of 1100 deg C before rolling. 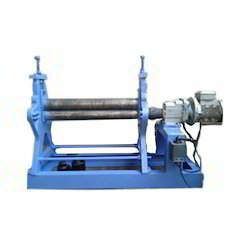 Thin sheets are obtained by cold rolling.To enable students to understand components of a rolling mill and to conduct a few experiments to understand the rolling process. 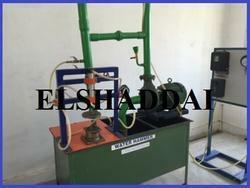 The equipment consists of a 50 kg weight which is allowed to fall on a water column. The other end of water column is connected to the die bottom. The sheet metal specimen is placed below the die and the die is clamped. Now hammer falls on the water column and due the pressure wave, sheet metal takes shape of die. The weight is lifted to its original position, formed material is removed and next specimen is placed. This cycle continues in this process, the potential energy lost by the weight is utilized for forming. Looking for Metal Forming Lab ?